William BYRD: Propers for Advent : Rorate coeli desuper, Tollite portas, Ave Maria, Ecce virgo concipiet. 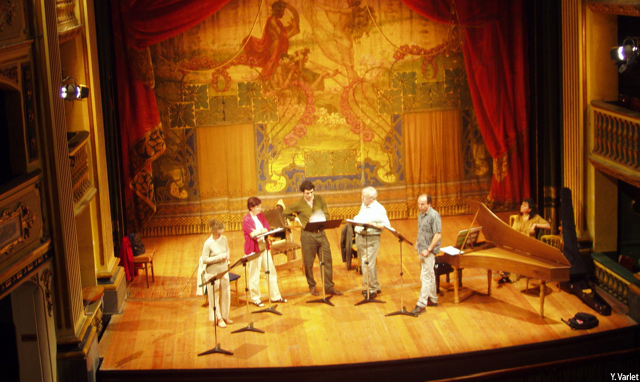 Under the influence of the Jesuits and the Oratorio” of S Filippo Neri, the “moral oratorio” flourished in Rome during the first decades of the 17th century. Our programme includes examples by the acknowledged master of the genre, Giacomo Carissimi (including his masterpiece, the History of Jephte and the sacrifice of his daughter) as well as works by his contemporaries Rossi and Marazzoli. From the generation before Bach, exceptional and passionate works by BUXTEHUDE, SCHÜTZ, TUNDER et WECKMANN, for small formation. It was Johann Sebastian who was largely responsible for the preservation of works by his family, prompted by their value as models as well as family pride. He was particularly impressed by those of his uncle Johann Christoph, which he described as “expressive and profound”. As we listen to the extraordinary motet Merk auf mein Herz, a kind of fantasia with seven variations on the well-known chorale Vom Himmel hoch, we understand perfectly his admiration. From the generation before Bach, exceptional and passionate works by BUXTEHUDE, SCHÜTZ, TUNDER and WECKMANN, for large formation. Christian GEIST spent most of his life in the Hanseatic world of Scandinavia and North Germany. In this programme, his vocal music is put in the context of the music of his great contemporaries Diderik Buxtehude and Nicolaus Bruhns. Conceived for a more intimate space, this programme consists of “vocal chamber music” by Geist and his contemporaries, full of expression and emotion, most of which is found in the famous “Düben” collection in Uppsala. John Blow, contemporary, teacher, colleague and friend of Purcell, composed 28 anthems with instruments for the Chapel Royal in the Restoration period, more than anyone else (Purcell composed 25). Blow style was very particular, impregnated with the English love of “false relations” the angular melody beloved by his predecessor Matthew Locke, and a highly developed dramatic sense. It shows also a very developed sense of form and balance, giving some of his works an almost “symphonic” feel. Among Handel’s earliest experiences setting English sacred texts – experiences which would bear fruit in his Oratorios – are the eleven “Anthems” composed during the years 1717 and 1719 for the Duke of Chandos at his sumptuous stately home, Cannons, near Edgware. 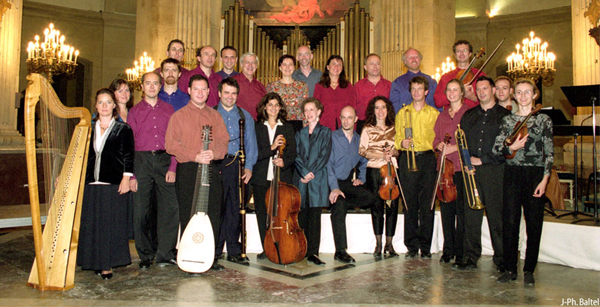 The Ensemble William Byrd has given a large number of exceptional works in concert, among them both 40-part motets (Tallis’s Spem in alium and Striggio’s Ecce beatam lucem), and Biber’s gigantic Missa Salisburgensis for 53 real parts. Also in our repertoire is Brumel’s 12-part Missa Et ecce terrae motus, Monteverdi’s Vespers, and both Dixit Dominus and La Resurrezione from Handel’s Roman adventure in 1707. 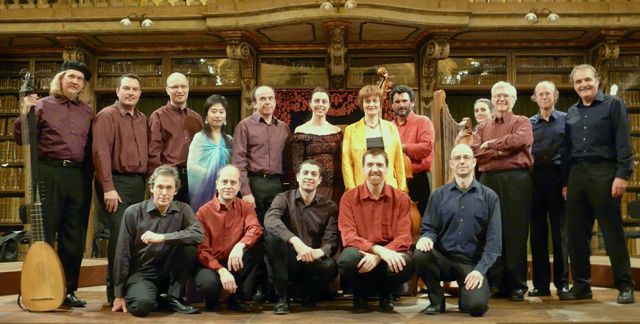 We should also mention Purcell’s music to The Fairy Queen de Purcell, Charpentier’s to Le Malade Imaginaire, the Miserere a tre cori (12 voices) by the portuguese composer João Rodrigues Esteves, the Missa Lombardesca by Bartolomeij Pekiel, and the Missa St Wenceslaus by the Czech Adam Michna. The most famous St Cecilia Ode of the Restoration – that of Henry Purcell (1694) is placed in the context of the Ode which inspired it, composed by Giovanni Battista Draghi in 1687 on a text by the poet laureate John Dryden. This work, which made a great impression at its performance in London, is rarely given, especially in Europe. The masterpiece of a cousin of Johann Sebastian, who appreciated his music enough to copy it and perform it in Leipzig. Christian GEIST : Domine qui das salutem regibus; Exaudi Deus orationem meam; Quis hostis in cœlis; Zitto hoggi Fattere; Io musae, nove Sol rutilat etc.